Week in and week out during the winter months some of us find a curious addition to our delivered or CSA vegetable box. Nestled in amongst the common-as-muck dirty potatoes and carrots, under a canopy of cabbage and kale, lurks a mystery vegetable. Knobbly or smooth, these baseball-sized ghostly green or imperiously purple orbs offer a dilemma to many: what are these things, and what the heck do I do with them. Most likely they are kohlrabi. And they are delicious. These odd wee globes or ovoids look much like turnips – to which they are related – but offer a flavour much more akin to the sweetest broccoli stems (which are my favourite bit of the broccoli plant – much superior to the actual florets, imho). Low-calorie and high-fibre kohlrabi are a delight to cook with, making an interesting and nutritious addition to soups, stews, bakes, pies – even salads when very young and exquisitely sweet. Here I have treated a tired old kohlrabi, well past its creamy-fleshed best (no snickering please) to a soak in some truffle-scented cashew cream. It is joined in its task of filling a tummy cheaply and healthily with swords of ruby chard, a good old onion and that stalwart of winter vegetarian cooking, winter squash – in this case the beautiful Crown Prince variety (below). But first, before the recipe, a confession: I rather mucked this up on the first go round. The result I was going for was hearty rather than whisper-thin layers, so I foolishly set about just thickly slicing and sautéing the vegetables – no pre-pre-cooking, if you know what I mean. But I should have followed my own advice in a previous gratin of summer vegetables where, despite the lighter vegetables (literally), I cooked them twice. They melted in the mouth. These more wintery guys need steaming. From there you can add them in with the sautéing onions and chard, or just mix them all and add the sauce and bake. Either way is easy. Other than the kohlrabi I should also like to highlight the cashew cream. Although I am not a vegan I do like to make and use cashew cream for most instances where cream is either called for or is too good an idea to forgo. Here on food to glow I have used a sweet version with my Quick Pear and Tahini-Honey Tart (a favourite at work) and Cardamom-spiced Fig and Plum Galette, and the savoury version I highlight in my Creamed Kale recipes and ‘Creamy’ Broccoli-Basil Soup. We have pretty much stopped using ‘real’ cream as we prefer the taste and healthier fats of the cashew cream. And it is dead-simple to make, especially if you have a powerful blender, like my beloved Vitamix Aspire (the slightly cheaper and smaller version of the big daddy version). Adding nutritional yeast makes it a fairly credible ‘cheese’ sauce too, and that’s what I do here. As for the truffle twist, I have Jennifer of Savory Simple to thank for that idea. It is a keeper. 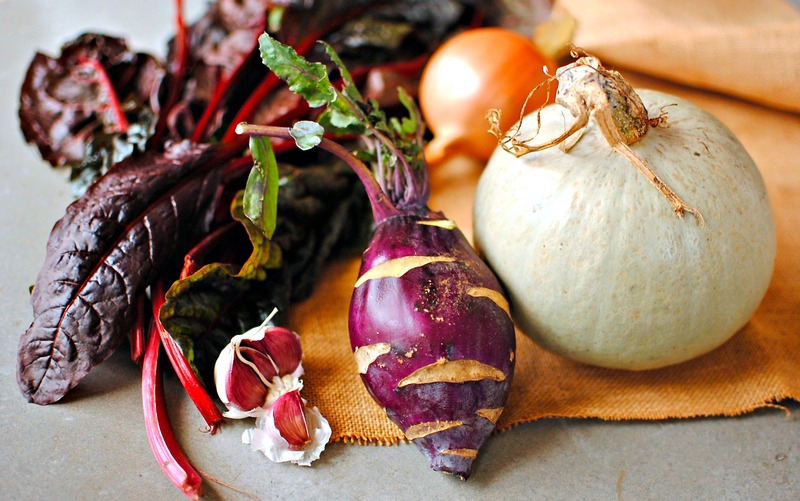 If you fancy other ways to use those odd balls in your veg box,The Kitchn offers five ways to eat your kohlrabi – so no excuses for ignoring this stalwart of the winter CSA/veg box. The shy star of this dish is undersung and underused kohlrabi. It is not always the prettiest of vegetables, but the nicely crunchy flesh and mild turnip taste will win you over. Use small golf-ball sized specimens for the finest flavour and texture. Kohlrabi is good raw in a remoulade, a crisp salad (perhaps with frazzled bacon), in soup, stews and steamed and mashed with potato to top a pie. I’ve done a combination of steaming and sautéing: do all steaming if you want to really cut the fat (but do sauté the onions). And of course, do use thick cream rather than the stipulated cashew cream if you so fancy. A slow dish for a lovely winter supper. Serve with more greens. 1. 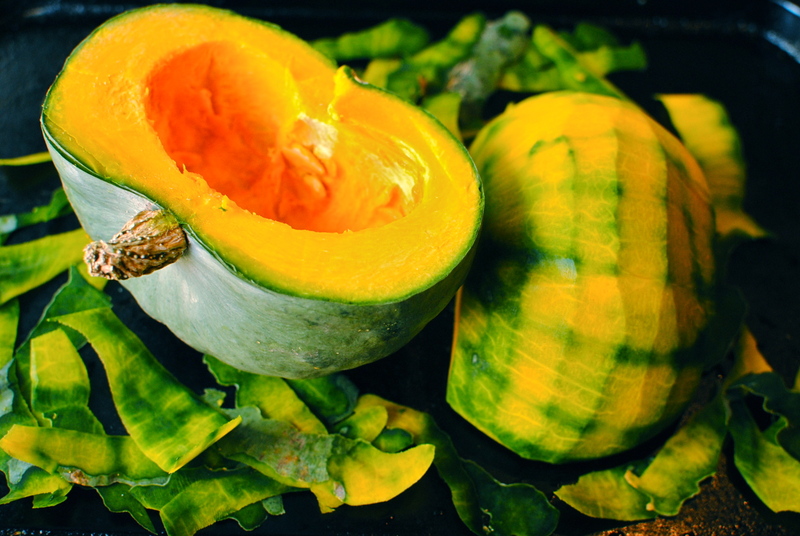 Steam the squash and kohlrabi for 8-10 minutes, or until the point of a knife slips in easily. 2. Meanwhile, in a large frying pan, saute the onion over a medium-low heat in the olive oil until translucent. Add the chopped greens and garlic; stir and sauté until the greens are wilted and soft. Add in the steamed vegetables and stir to coat and mix. 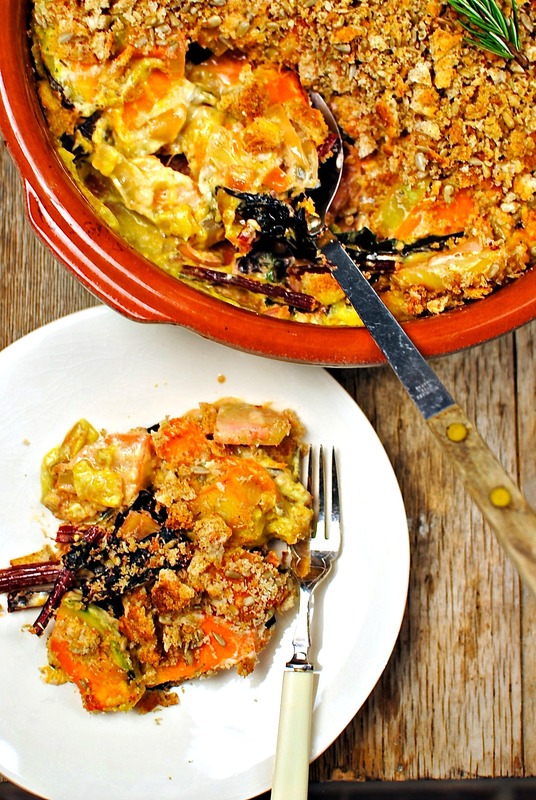 Pour the vegetables into an oiled gratin dish or ceramic/glass pie dish. 3. Mix together the cashew cream, vegetable stock and ½ tbsp of the rosemary leaves and pour over the vegetables, using a fork to coax it into all nooks and crannies. 4. In a small bowl mix together the fresh crumbs, seeds, nutritional yeast, seasoning, remaining rosemary leaves and melted butter. Scatter this over the vegetable mélange. 5. Bake in a 180C/350F oven for 45 minutes, lightly covering with foil if the breadcrumbs brown too quickly. Boil the water and pour over the cashews. Leave for half and hour then put all in a blender and blitz until smooth. Taste for seasoning, adjusting as needed. This will be fabulous instead of a cheese sauce for mac and cheese, cauliflower cheese, or any similar dish. Here’s a fun idea for making vegan nachos using cashew cream as a base sauce. 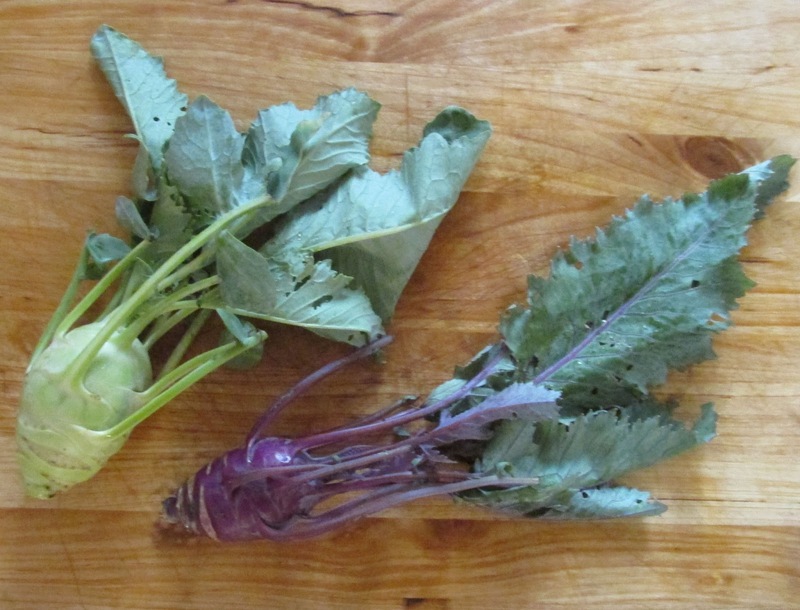 Nutrition Notes: Kohlrabi is a milder member of the wild mustard (brassicaceae) family and as such is packed with the nippy glucosinolates that hallmark this healthy family of plant chemicals. Other better-known members of this family are kale, collard greens, Brussels sprouts, turnips, bok choy, horseradish, wasabi, cauliflower, cabbages and broccoli. It is also loaded with folates and heart healthy potassium, a mineral known to help control blood pressure and increase bone density. The Linus Pauling Institute has a good overview article on the health benefits of cruciferous/brassica vegetables in relation to cancer risk. Buying Tips: Bought at its best it will be golf-ball sized with a froth of out-sized green leaves, looking much like baby turnips, to which it is often compared. Kohlrabi tend to be sweeter than turnip, so if you aren’t keen on turnip but want some similar nutritional benefits, try lovely young kohlrabi. Very young samples are fantastic thinly shaved and lightly doused in a vinaigrette – carpaccio-style. They tend to be pale green, verging on white, with some varieties being a lovely purple. The kohlrabi I have in the images is bigger than you would like, and to be honest was quite woody. Aim for anything up to a baseball size. That is so funny, I have also been puzzled by the kholrabi, which I just sliced and ate with hummus. It was good, but this sounds better! Actually with hummus is a super idea – no cooking required! I’ve been told I should try kohlrabi but I didn’t even know what it looks like! Beautiful produce, everything looks amazing! Thanks so much Becca. Gotta have some creamy luxury in the cold months when you can really appreciate it. And why not make them vegan and extra healthy? Sounds delicious! Im on rather a super frugal budget at the moment, so would appreciate advice on the best ( read cheapest!) place to source raw cashews, nb im in the UK on tne south coast. Great question Diane, and one I’m sure others are wondering. Tesco in the ‘world cuisine’ section, Asian supermarkets and Makro/Costco are good haunts for nuts and spices. Skip the truffle oil of course but I got mine in TK Maxx. Fab, thank you! Now I can make cashew cream AND peanut butter! Simple pure indulgence with a wholesome healthy kick. Another culinary triumph. Even though it is too hot to even contemplate looking (let along turning on) the oven, that cashew cream is tempting enough to crank up the blender and use as an unctuous rich salad dressing. That’s rubbish that it is still so hot down your way. The cream is excellent cut with lemon juice as a dressing, for sure. And maybe add smoked paprika, or onion and garlic powder to mimic a ranch dressing. I hope you like the song – my choice 😉 Miss R was proud of me with this one! ????? If 30C for Tasmania isn’t hot I don’t know what is??? We get reprieve tomorrow with 22C and possible showers but we have a day of hot in between that we have to wait out. Didn’t check the song yet as Steve had to head into town early and was doing the “good wife” thing (got to do it sometimes 😉 ). A beguiling winter delight! All the savory flavor paired with the enchanting cashew cream make for a tempting way to use up all those winter veggies! Perfect timing – I’ve been shaving my kohlrabi from the farmers’ market into salads but the girls aren’t that keen on the radishy taste (I love it). I’ll sneak it into a gratin. Shaving is good for the young stuff, and a comment suggestion of dipping the raw slivers into hummus sounds yummy too. Is it ever cold enough for gratins in Dubai, I wonder? Nice to hear from you, Sally. I envy your markets at this time of year. They must be bursting with spring-like produce right now. 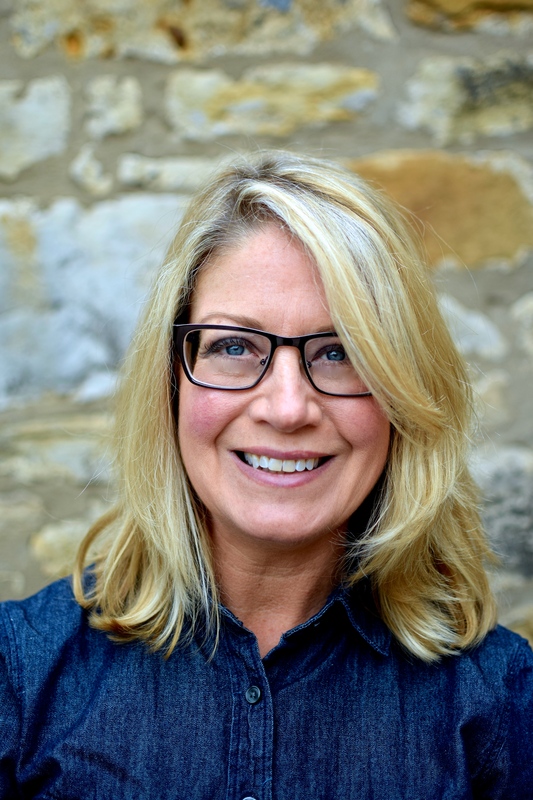 I’d love to know what you’d make of our markets Kellie. You’d have a field day. Thanks so much Deena. 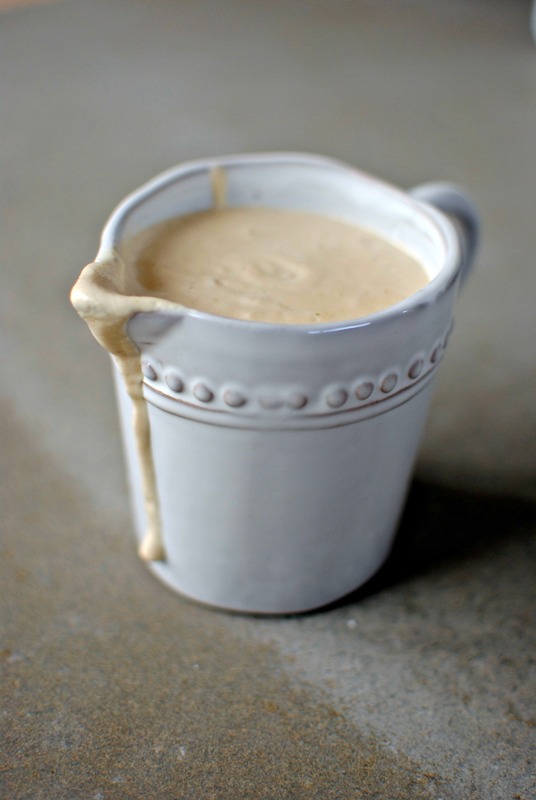 Cashew cream is incredibly adaptable for sweet and savoury dishes. 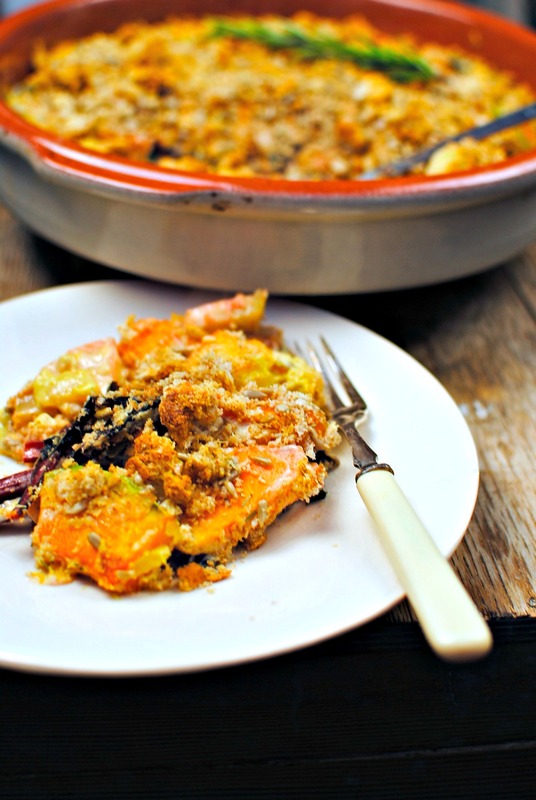 I had cashew cream at a Vitamix raw food event ad loved it, I imagine his would make a wonderful gratin and kohlrabi is something I always used to get in my veg box. Love it yet rarely buy it now sadly. Looks like we have a lot of the same ideas about food- can’t wait to read more! feel free to check out my recipes as I start posting them too! Lovely idea of cashew cream, the truffle oil making this a really special idea. – I fancy this cream with other roast vegetable dishes. Such a great idea and your bright gratin is so cheering! Very nice; and I love your new theme choice.